How well do you know your future partner? This question isn’t just a fun party game. It may be the most important question to ask yourself as you embark on one of the biggest decisions, and purchases, you’ll ever make. An engagement ring isn’t just a promise of love and devotion, it’s also about personal style and preference – something she’ll want world to see every, single, day. Now that you know the importance of understanding your significant other’s style preferences, here are the details you need to know. Pay attention to what types of jewelry your significant other wears. Obviously, an engagement ring is an everyday, lifetime accessory, so it should match her everyday style. But, if your significant other doesn’t seem to have a preference, here are a couple of tips. -Platinum and white gold are the most popular choices and can often best accentuate the diamond. These metals also tend to complement cooler skin tones. -Yellow gold and rose gold are becoming more and more popular; and as a general rule of thumb, tend to complement warmer skin tones. Stone, or Should We Say ‘Stones’? Though diamonds are popular and durable, not every engagement ring is a diamond ring. Other popular engagement ring stone choices are sapphires, rubies and emeralds. If your significant other does, in fact, desire a diamond ring, it’s important to determine how many diamonds she’s in the market for. If she’s more conservative and classic, start with a simple, single-stone solitaire. If she’s a little more fashion forward, take a look at some rings that incorporate 5 diamonds, halos, three-stones, etc. Does your significant other wear a lot of patterns and prints? Or is her style more singular and simple? Knowing a little bit about her fashion preferences can give you a pretty good sense of whether she’d prefer an intricate band or something more simple. Her lifestyle also can play a part, and by working with your jeweler they can help you identify the design that’s right for her. So if she’s very active at work or play, going to constantly be wearing her ring at the gym (we advise against this), etc., you may want to consider a more durable option. Is your significant other the type of person that will swoon over an intricate and unique estate ring? Or is she more likely to drool over a simple, clean-cut modern ring? If you don’t know the answer to this question, it’s best to see some ring options in person and talk through what you think your significant other would like. 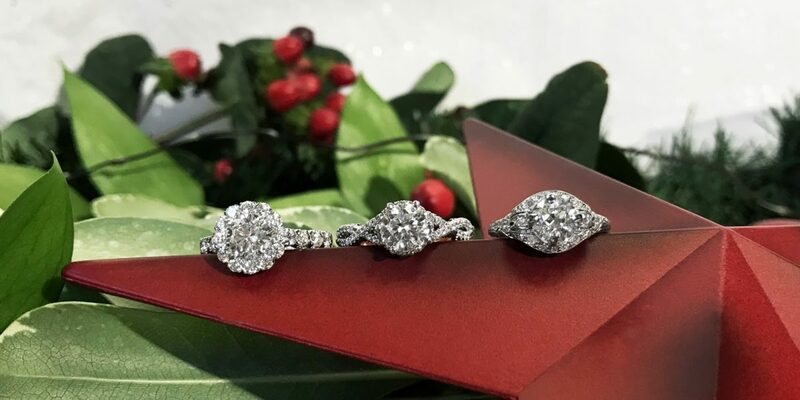 In some cases, it might be a hybrid (Verragio for example makes modern rings with a vintage feel) and an expert can help point you in the right direction. Seeing is believing after all, which is why we believe the best way to shop is in-store. That way, you know exactly what you’re getting. If you’ve read through all of these tips and still can’t decide on a ring direction, and want to keep that ring a secret, ask around! Ask her best friend, ask her siblings, ask her parents. They’ll all be willing to help you out. And remember… always save and bring with you those pictures she may have shared with you along the way!